On the "Munda Bindi Trail"
Hi, Pete and Jen here. We are Tasmanian born people and have extensive knowledge of what Tasmania has to offer. 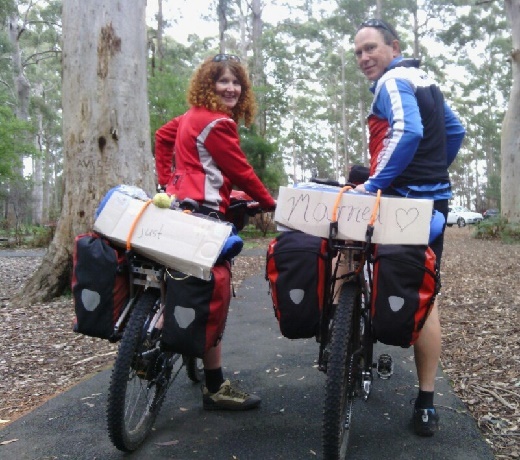 We are a recently married couple and our wedding was atop the "Gloucster Tree" near Permberton W.A during a ride through the Munda Bindi Trail on mountain bikes, we do quite a few things together. We both like to travel, go camping and 4x4 all over the country side here and on the north island, We are avid mountain bike riders, road riders, and enjoy racing & riding motorcycles in fact we like to try most outdoor activities. Pete has been in the caravan & motor-home service & repair game for quite some time now (over 16 years). Every year at holiday time we see so many campers breaking down that it's a bit sad, especially when you think all that time and money wasted fixing things when a bit of maintenance could have avoided the whole situation.